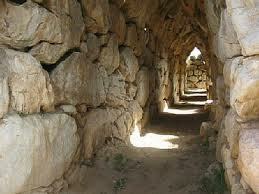 One of the galleries at Tiryns, Minio's Castellazo. On 9 October 1480, the Greek kapetanios Krokondelos Kladas led a company of stratioti out of Koroni in a private war against the Turks in Mani. 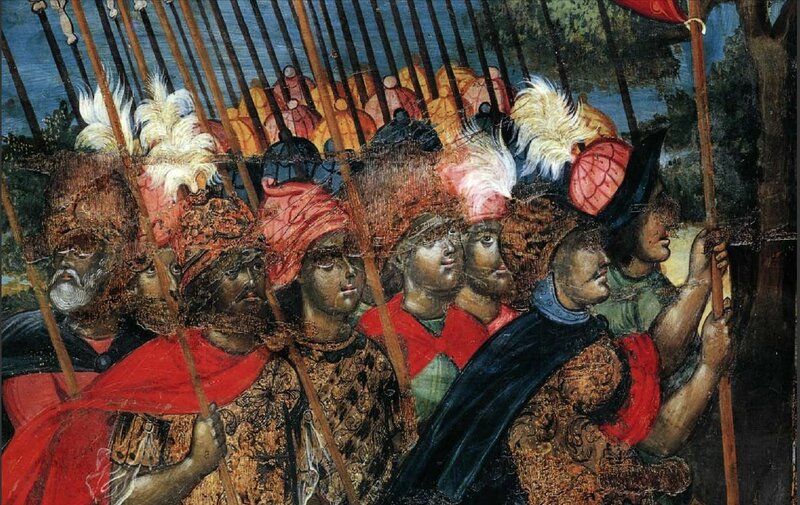 He carried a Venetian banner, to give the impression that he had serious backing, and he acquired Greek, Albanian, and Italian supporters as he went. Mehmed II wrote Venice that he knew they had nothing to do with it and sent two different military expeditions to bring Kladas down and punish his accomplices. Ottoman reprisals were terrific, towns were burned, hostages taken, a few prisoners sent to Constantinople where they were cut to pieces. The impression from the documents is that it was not those responsible who received the brunt of the punishment. Kladas and Bua fought over control, Bua pulled out. Avoiding the dragnets across the Mani, many of the rebels made their way toward the borders of Koroni and Nauplion territory and started operating as bandits. Nauplion's provveditore, Bartolomeo Minio, banned the bandits from entering Nauplion territory and prohibited the sale of their goods. Nicolò Navagero, did the same for Koroni territory. This was their only defense when they could not lay hands on the guilty. In early March, Bua got in touch with his cousin, Ismail Pasha, voivode of Karitena (who had taken troops across Mani) and asked for pardon. On the 12th Ismail wrote Navagero, provveditore of Koroni, proposing that both sides grant mutual amnesty -- he knew Navagero well after spending three weeks with him the previous fall in negotiating the territorial boundaries, but Navagero replied that he was unable to take such an action. 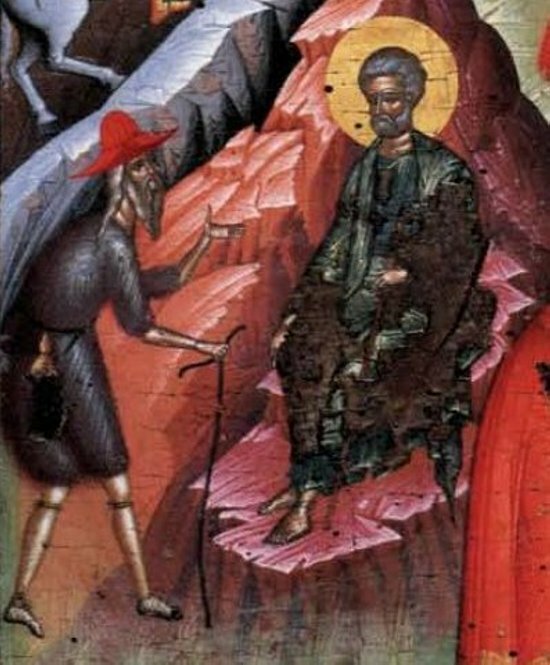 Bua, taking pardon for granted, went into Monemvasia where he was immediately recognized and jailed. In April, Kladas abandoned his followers, perhaps a day before certain capture near Porto Quaglio, sailing away on a ship belonging to the King of Naples on which there was someone he knew. For nearly a year, what was left of the revolt remained in a limbo, with some of the rebels hiding in the mountains, some looting and attacking Turks. In January of 1481/82, Ahmed Beg, the new Ottoman governor or sancakbeg, arrived in the Morea. On 13 February, he -- with 300 horsemen and his personal staff -- met Bartolomeo Minio -- with 500 horsemen, 200 foot, and half of Nauplion -- at Castellazo. Then the two of them, each with five attendants, withdrew to talk. After issues of mutual interest had been discussed, and much good will exchanged, Ahmed Beg took one of the voivodes as a translator, Minio took his secretary and his translator, and the five of them talked privately. I chose the picture above of one of the galleries at Tiryns, as it seems a most likely place for them to have talked. It offers shelter from the February chill, and privacy. Ahmed Beg said that he wanted to put the matter of the revolt to rest. One of his voivodes who was related to the Busichi clan, and Ismail Pasha, had been working on it (or maybe the voivode and Ismail were the same person), and he asked Minio if he would share in a joint pardon. Minio said that he himself did not have the authority to pardon rebels against the Signoria, people who had violated their peace agreement with the Ottomans. Ahmed urged him again, saying that if he -- the offended party -- was willing to forgive them and Venice was not, it could be taken that they were willing for the rebels to continue. Minio saw his point and said that he would write to the Signoria. It was agreed that, until they had the Signoria’s response, the rebels were to withdraw and remain quiet. The voivodes and some of the kapetanioi said they would speak with their rebel relatives and asked for three days to get an answer. By the end of the three days, the kapetanioi brought word that Mexa Busichi, Elia Sagan, and Canessi Climendi, the rebel leaders, were willing to accept that. So Minio sent his secretary with two Nauplion citizens with the kapetanioi to meet the rebels and record their oaths to remain at peace. Minio wrote the sancakbeg about this, and received from him a pardon and safe-conduct for the rebels. The Magnificent Captain General, held a review . . . through the bad information given for their advantage by those who were close to his Magnificence, . . . many of the old and competent stratioti have been rejected and their appointments annulled, and other useless ones taken on. Mexa Busichi, a competent man, and personally more valuable than his other Busichi brethren . . . was downgraded and listed as a simple stratioto. . . . Elia Sagan, who was a kapetanios of the stratioti, a provisionato, and one of the old stratioti of this territory . . . and his brother who was also a kapetanios and provisionato and others of his family have died in Your Lordship's service . . . was not only discharged . . . by the aforesaid Misier Hieronimo, but was also beaten. He said a great deal more than this. (See Letter 72) Minio’s sense of unfairness and his strong loyalty to ’his’ stratioti won him enormous loyalty in return. His arguments convinced the Signoria, and within six weeks the first pardons -- seventeen -- were issued. It took several months to get it all settled, and the Busichi had to be pardoned for assorted homicides as well, but it was done, and then Venice offered them all jobs fighting in the Ferrara war. How they were seen in Italy is described here . In fact, the stratioti were so contemptuous of the leadership they got in Italy that they refused to fight if not assigned a leader of their own choice. They were given Minio. The sequel to this story, and the Ferrara war, will be told in a few weeks. Minio’s letters are dowloadable here. Volume 1, Dispacci from Nauplion, 1479-1483. 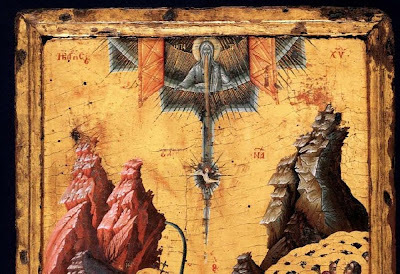 A correspondent sent me a link for for the eccentric site http://library.nu/ from which you can download a remarkable number of scholarly books (hint: on every page, scroll down for the button you need). Searching on this site for 'Byzantine,' I found on page 52 [Note: this hasn't worked for a while. Try this link from one of the authors.] 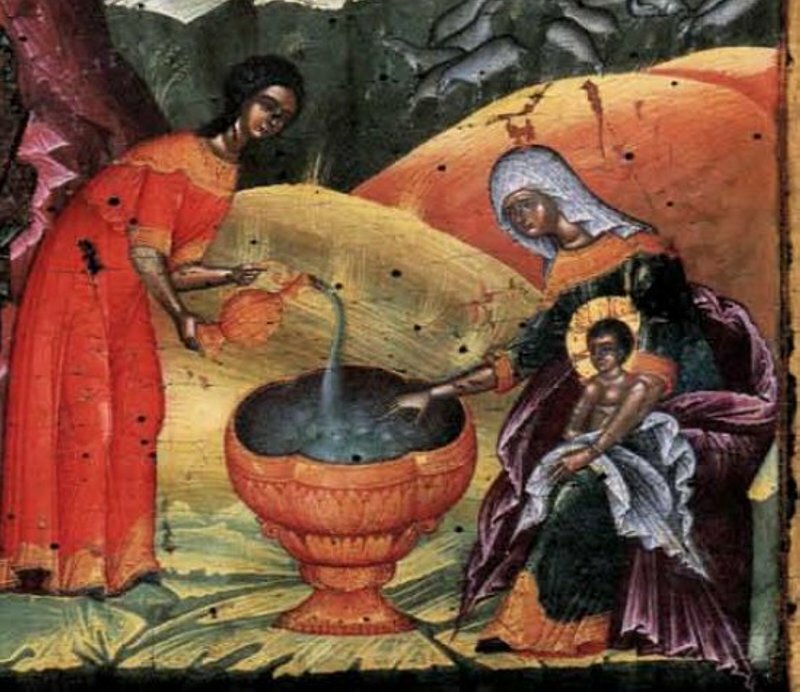 a remarkable book of icons entitled Icons from the Orthodox Community of Albania. * It is a catalog from a 2006 exhibition of the Museum of Byzantine Culture in Thessalonike, and represents a high-water mark of cultural cooperation. 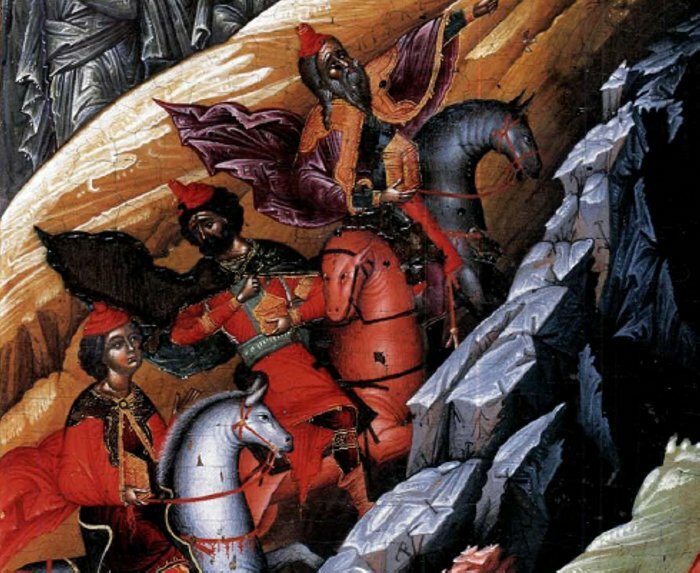 In 1999 at a point when western civilization had gone beyond shame, the General Consul of Greece in Korçë, Nikolaos Garilidis, was asked by the Director of the National Museum of Medieval Art for assistance in saving the 6,500 icons in the collection from possible consequences of the Kossovo war. 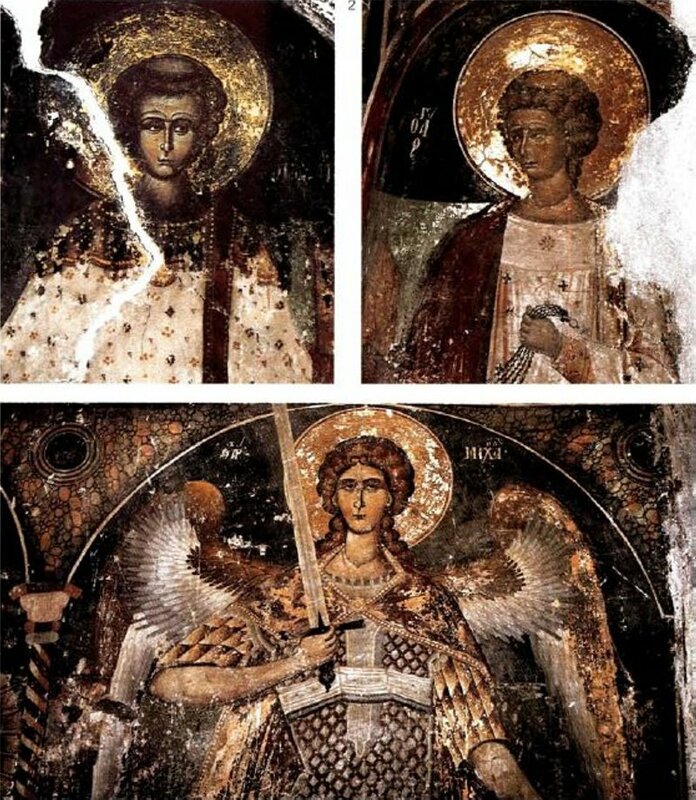 In an act that has held back the powers of darkness a little longer, Garilidis enabled a cooperative program between the Korçë museum, and the Museum of Byzantine Culture in Thessalonike, in which 88 icons were transferred, studies, and restored. 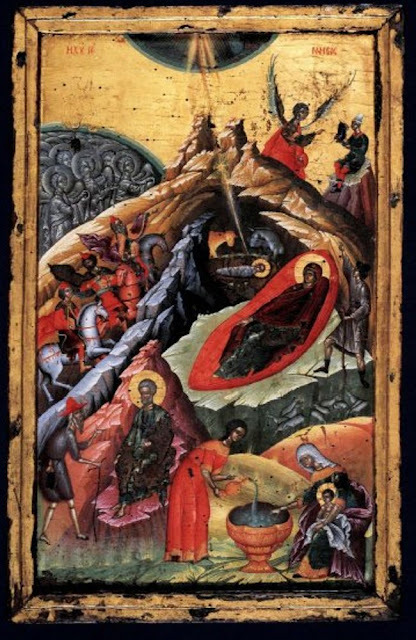 I have found these icons astounding -- I can't recall ever seeing anything identified as Albanian icons -- and am giving here several, with details, for you to rejoice over. But these are only two -- three with the cover image at the end -- and this book has many wonders. All the images here ( except the last) are by the painter Nikolaos Onouphrious -- surely one of the greatest colorists and artists of all time -- whose painting seems to have happened mostly between 1547 and 1554. (All of these images should enlarge when clicked on.) I have never seen colors of the saturation and intensity that Onouphrious used -- look, for example, at the detail below of bathing the Christ Child. After the icons are three frescos, frescos that give forth their own silvery radiance. 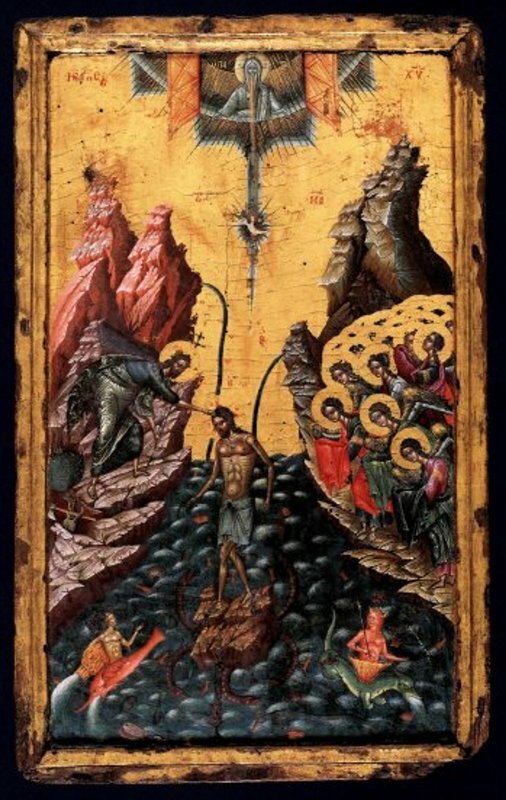 To begin with, look at the electrifying God-the-Father in this detail from the Baptism icon, the beard that becomes light and sound, the rocks that vibrate with light, the interlocking circles of the halos and go back and look at the construction of the whole painting, the universe splitting apart to show who Christ is, and the waves about to burst into new forms of life -- these waves echoed in the baby's bathwater. The Nativity appears to have the customary iconography but in this one -- again something I have seen nowhere else -- the womb of the mountain embraces both the Magi and the birth, and the infant and mother are facing in the direction opposite to their usual. The right-hand curve of the cave and the curve over the grisaille angels reflect the circle of heaven, but the emphasis here is on the realities of human life, and these are given the glorious color -- the women bathing the baby, the shepherd playing his bagpipes, Joseph who is somewhat left out and who has to explain to a stranger what is going on. And then there is the rhythmical interchange among the curves of the Magis' horses' necks and their gestures and their billowing cloaks. 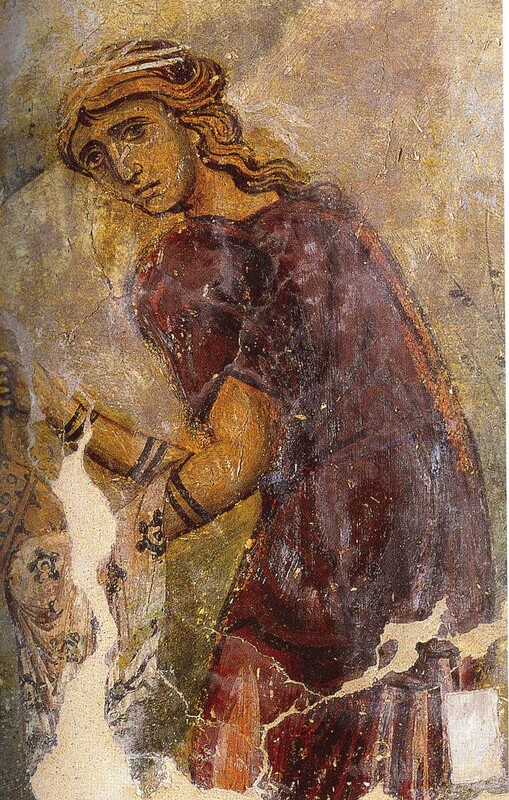 There are apparently a number of Onouphrious frescos in the area between Berat and Kastoria, and several others in Kastoria. This is a palette of colors unfamiliar to me in frescos, and utterly luminous. 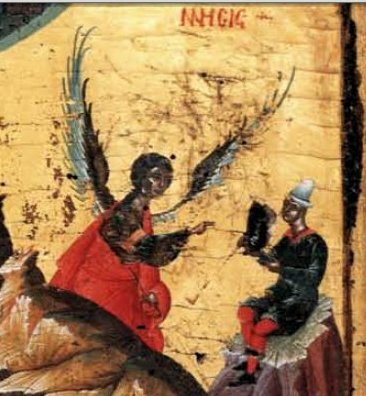 Icons from the Orthodox Community of Albania. Ed., Anastasia Tourta; text, Eugenia Drakopoulou. Thessaloniki, 2006. Catalog from the Museum of Byzantine Culture. Roman soldiers leading Constantine's triumphal procession. Hush I stole them out of the moon. These are the first two poems I ever discovered, which means, I found and read them for myself and was each time left breathless and with chills down my neck. I still expect poetry to do that for me. 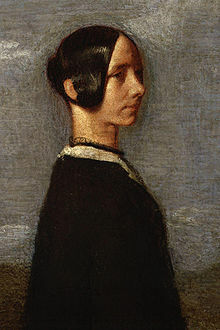 Jenny was Jane Baillie Welsh Carlyle, the wife of Thomas Carlyle, a tiny woman. She jumped up out of her chair and kissed Leigh Hunt when he came to tell Carlyle that the publisher had accepted his French Revolution. I spent fifty years looking for green glass beads that looked like the beads I saw for the nymph and goblin. I finally found them, inexpensive soda glass from Africa. This is one of the five bookcases in my workroom, one of at least twenty-five or so in the house, but it is difficult to be definitive because a couple of rooms have them on three or four walls and under the windows. These are our warmth against the chill of an increasingly vulgarized culture, our tools, and our companions. The bookcase closest to my desk hold books most used for current work -- several by friends, and the 15th-century historians: Sphrantzes, Doukas, Kritobulos, Chalkokondyles. And of course, other things have fetched up there, like a stack of dissertations on top. The middle bookcase is books on Nauplion, Athens, Mistra, and Crete, plus 3 shelves of dictionaries, and one of other peoples' offprints. And other things. Some Athens, and a reminder of my roots. The one nearest the door, the one pictured at the top, is art and architecture, while behind me and bumped when we open the door is Pierre's enormous collection of Greek texts. The fifth is small and has more library books, books that should be shelved somewhere else, files and books for the next shared writing project. Inter-library loan books unstack themselves on the floor among seven file boxes. There is also a bed, usually blanketed in books, so it hardly counts as a bed, though I managed to get it usable for visits from Nick Nicholas and Michael Pettinger, my authorities for medieval Greek and Latin. My reminder from Theocritus: "It is not easy to find." The "emeralds" are a 32-year family joke. The floor has a very nice Persian-style carpet, though the degree of niceness is irrelevant as it is mostly covered by the boxes of files I am using for the Kladas book* which is processing slowly but surely. Slowly, because I have been surprised by time. Slowly, because I have written several long articles in the past year, most on material that I use in the book, and four speeches. Slowly, because the fifteenth-century Morea was such a spirit-sucking culture that I find myself frequently drained. The accepted level of peacetime violence, the frequency of plague, the exploitations by the archon class, the corruption of a church organization that possessed one-third of the land and thus removed it from the tax base, the cultural misogyny, the evident despair of the Palaiologoi and their withdrawal from responsibility (always with the exception of Constantine), the dreariness of the Mistra intellectuals who could do little more than harp on the Procession of the Holy Spirit, the Ottoman threat always present like a bad smell in the drains --these devour psychic energy and must have done so in the fifteenth century. and my dear Ephraim Boms,** in a coma in Athens since September. Nevertheless, I now know the Palaiologoi at least as well as my own family. Kladas I know no better than I did when I first wrote about him in my dissertation 13 years ago. I have found previously unused information, and I have evolved ideas I have seen nowhere else, but the man himself resolutely remains a stranger to me. I have gained no access to him through his peers though I have become admiring of Petro Bua. I have a sense of Demetrios Asan and Manuel Rallis, despite their repugnant personal activities; I have a certain sympathy, though dislike, for Demetrios Palaiologos, and a deep affection for Demetrios Pepagomenos. The great Bessarion, Cyriaco of Ancona (after all I have written about Cyriaco, I have no sense of him, either), and Giovanni Dario, have become my private Trinity. *** But there is a shell surrounding Kladas -- perhaps in compensation. * The Knight and Death: The Kladas Affair and the Fifteenth-Century Morea. ** Ephraim Boms, after nearly a year in a coma, died on August 7, 2011. A Reader at St. Paul's Anglican Church in Athens, he had been preparing to study for ordination as a minister. He leaves a wife, and daughter and son in Nigeria. *** I notice that these are all people for whom I have contemporary portraits, though Cyriaco looks nothing like I had pictured him. I wonder how much that matters? 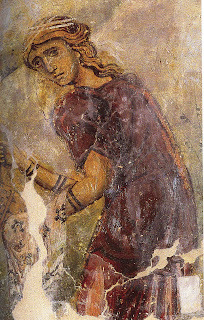 In the early spring of 1430, in Adrianople, Cyriaco of Ancona purchased Chaeonia who had been taken in an Ottoman raid. Chaeonia may not have been what she thought her name was: it means "woman from Epiros" in a literary sort of way and that is exactly the kind of name Cyriaco was capable of making up. I am sure she was beautiful: he bought beautiful things. He had spent that winter in Adrianople and that is when he had his first lessons in Greek. He wrote that he began Greek with the Iliad, but he may have begun Greek with Chaeonia. Later he renamed her Clara, but soon after he bought her, he took her to Gallipoli where in March he sent her to his mother in Ancona, along with bundles of skins and carpets, under the care of his cousin, Ciucio. (Cyriaco constantly writes "we" in his letters and diaries: might his cousin have been part of the "we"?) Then he and his black freedman, Niccolino, went down to look at the lovely ruins of Philippi, and then Thessaloniki. Freeing a slave in the medieval Mediterranean did not necessarily mean what we would like to assume it meant. Often, documents have a condition: "You will nurse my child for three years." "You will stay with my mother until she dies." "You will work for me for two -- or five -- years." "You will stay with my daughter until she marries." One record of a woman's emancipation, at Methoni -- I treasure this one -- was followed on the next day by the record of her marriage to her "owner." So what was Chaeonia/Clara in Cyriaco's life? It is, I think, impossible to saturate yourself in his writings and then think of him in terms either of love or lust. One biography of Cyriaco fills out this part of his life with several pages of discussion of the functions of slave girls in the medieval household, and calls her Cyriaco's concubine. And it could well have been that way. He was 39 years old when he bought her. He was a person to be kind, and he also -- let us take this a little further -- though not a handsome man, would have had better personal hygiene than most: he dealt in mastic from Chios, valued everywhere as a breath freshener. Was he thinking in terms of a family tomb, and including Clara because she had become an integral member of their household? Surely, if a man is planning on mingling his bones with his lover's in the tomb he does not include his mother . . .
Kore. It means "maiden." Had Cyriaco collected a kore the way he collected manuscripts, damascened ware, and the occasional sculptured head, as a lovely possession among his other possessions? Or was she much more? Think: was possession of a kore -- one he had freed from the Turks -- in whatever way you interpret possession -- the way he could most truly possess his beloved Greece? Was she actually buried in the tomb, with his mother long dead and after Cyriaco had died away from home? 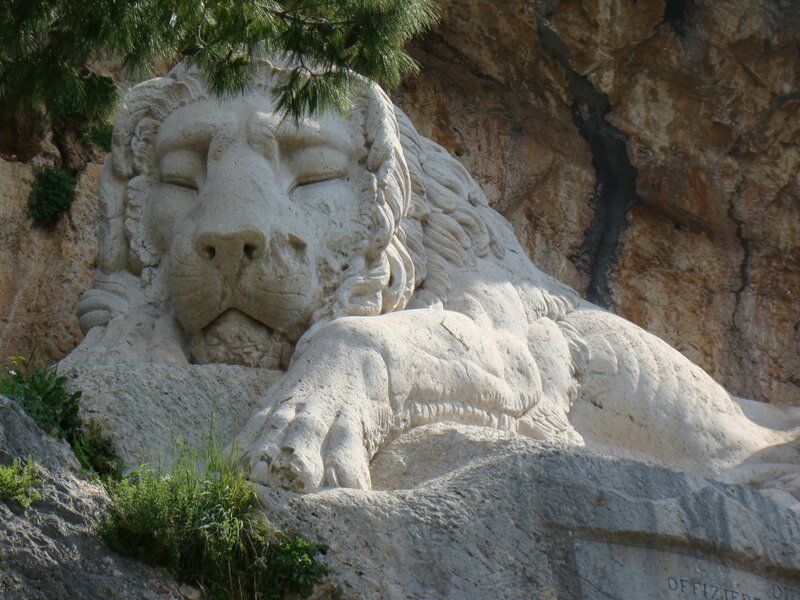 The Bavarian Lion memorial near the Nauplion cemetery. Brigitte Eckert translates Bettina Schinas' view of events around the creation of the Bavarian lion. Walk to hill behind Pronia. Sitting outside with S, reading, the sun so hot at the rock we were sitting on we had to take our coats off. Opposite from us Bavarian soldiers were again digging another grave in the graveyard which is meant for them, the last one which was filled has not yet dried on the simple hill which covers it. I counted 160-170 tombs. It is one of the many graves where these poor foreigners, sent here from abroad, rest from all their work. I feel deeply distressed for these poor humans. It is odd though that only soldiers are dying away, not the officers. I especially can't understand it as their lodgings are much more spacious and better fitted out for them than those of the French, when many fewer men died. Good care is taken for their food, they get the best meat etc. Probably it is also a result of the immoderate drinking of wine which is very cheap here, and the excessive eating of the superb and cheap fruit, which both are very attractive to them as they are very expensive in countries like Bavaria. To her parents, 29 November 1834. At this moment it is horrible in Athens, according to the unanimous witnesses of different persons. The information about the decision to move (the capital) there was given so late that building the most needed accommodations before the arrival of the regency was impossible. To get the necessary number of lodgings from the inhabitants measures were taken which were pleasant to no one: those who had to give away their homes are mostly pitifully accommodated and unhappy, all of them who were given are discontented, specially because they can't afford the exorbitant costs of moving, the lodgings terribly expensive, very small, and all that trouble in the bad season of the year. . . Many soldiers can not be accommodated at all, have to bivouac, diseases must be expected. Mr. von Falbe, the Danish ambassador, traveled ahead to outfit the lodging for his wife, Bavarian soldiers tried violently to seize hold of his house, he defended himself until police came to help him. People here say that a Greek coming home found his wife and children in the street and Bavarian soldiers sitting in his house, he killed one of the soldiers in the fight -- this still needs confirmation. I'm mentioning this because cases like this might be related abroad and give rise to wrong impressions. 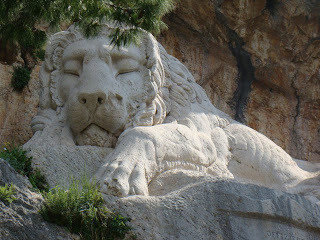 Memorial plaque for the Bavarian Lion. Copyright © Brigitte Eckert 2011. SEE Ruth Steffen: Leben in Griechenland 1834–1835. Bettina Schinas, geb. von Savigny. Briefe und Berichte an ihre Eltern in Berlin. Verlag Cay Lienau, Münster 2002. ISBN 3-934017-00-2.